Erin Coburn is a songwriter, vocalist, and multi-instrumentalist bringing a style all her own across a wide range of musical genres. Her prowess on guitar and electric ukulele are a striking complement to her original lyrics and honey-hued vocals. At age 7, Erin started playing the guitar and by 11, was going to every open mic around town where she honed her improvisation skills with several local bands. She got her first paid gig at age 12 and recorded her first original album, Chaos Before Conformity at 13. Erin regularly performs across the U.S. at venues and festivals of all sizes. 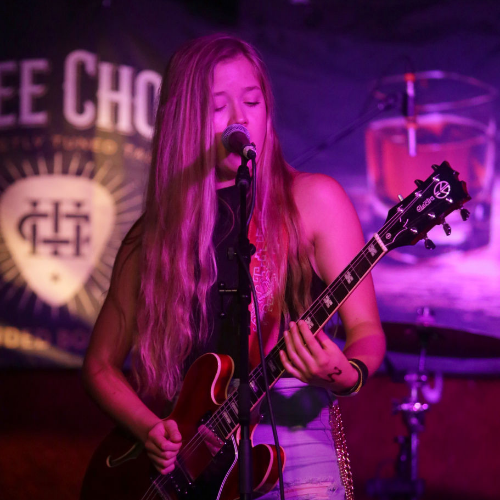 In 2015, she received a full scholarship to the Pinetop Perkins Master Guitar workshop and was awarded the Ann Rabson Memorial Scholarship the following year. Erin has performed with Grammy award winning artists in Nashville, was nominated for the 2017 Cincinnati Entertainment Awards in the blues artist category, and has several shows and festivals scheduled this year, including Summerfest in Milwaukee, BlissFest in Michigan, and the King Biscuit Festival in Arkansas. Some of Erin’s notable recent shows include a performance at the Ann Arbor Blues Festival, repeat performances at Buddy Guy’s Legends in Chicago, and the Slippery Noodle in Indianapolis, and opening for Larry McCray, The Marcus King Band, and Three Dog Night. Erin's second album, Queen Of Nothing, recently released when she was 16, is the expression of a woman coming of age in a confusing, mixed up, and often cruel world. The songs are easy to relate to, often hitting close to home. The album was recorded at Clarksdale Soundstage in Mississippi by 2-time Grammy nominated producer, Gary Vincent. Fifteen tracks take the listener on a journey that is a little bit alt-rock with a good dose of blues - a sound all its own. Opening the album is the catchy "Gold Chains Mood Swings," followed by Erin diving into the rock guitar-driven "Downpour" and then exploding into the empowering "Woman's World," all while threading in and out of a blues-rock undertone. Erin thrives on giving her audience something unexpected. She loves watching people forget their troubles and just enjoy the moment they are in while she is performing. Erin commands her band with effortless confidence, a smile that delights her crowd, and genuinely cares what her audience hears from her.